I have to admit to not having seen Monsters, Inc. before. It wasn't a conscious decision, I just never got around to it. So, when the Blu-ray edition arrived for review I wondered how well a 10 year old animated movie would fair when compared to the sort of computer effects that can be created nowadays. The animation holds up incredibly well, but to be honest it's not a huge problem anyway, as the characters are so believably portrayed by John Goodman (as Sully) and Billy Crystal (playing Mike) that I doubt this movie will ever age that badly. This release packages together two Blu-ray discs, so you have the option to watch the movie in 3D or 2D. We were only supplied with the 2D disc, so can't comment on the quality of the 3D edition. 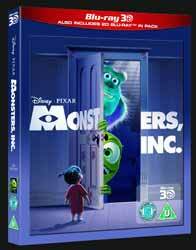 The 2D disc contains a number of extras including a full length filmmaker's commentary; an introduction by the director; Filmmakers' Round Table (21 min, 35 sec new feature that sees four of the team talking about their memories of making the film); Monsters, Inc., Ride and Go Seek: Building Monstropolis in Japan (7 min, 58 sec look at the Monsters, Inc., themed ride in Tokyo Disneyland); For the Birds (3 min, 28 sec animated short with optional director commentary); Mike's New Car (3 min, 47 sec Monsters, Inc., based short with optional audio commentary from the filmmaker's sons - which is amusing); Set Up (a handy onscreen guide to adjusting your picture and sound quality); and Sneak Peeks (basically a bunch of trailers... However, there is an interesting 3 min, 30 sec look at the new Monsters University). According the press release, the 3D Blu-ray also includes Toy Story Toons: Partysaurus Rex (animated short); and Outtakes and Company Play (which were on the original theatrical version's end credits). As you'd expect from a Pixar movie, this is a film that can be enjoyed from everyone from the very young to the very old. And some of the humour you could easily miss if you weren't paying attention. If you don't already own this, then it's well worth adding to your Blu-ray collection.